Skitch used to be the go to app if you wanted to share a screen capture. Now it’s part of evernote with more added features this has unfortunately meant more steps to quickly and snap and share. Now there’s a new contender to the capture and share arena, Glui, instant screen captures and sharing with nothing but of ease of use in mind. It all starts with a faithful camera icon that can either be on the dock, menu bar or a mix of both. Then it’s a choice of crosshair, window or fullscreen capture which is then ready of any annotating or simple uploading. Capturing a window has a nice feature of greying out the active window that’s to be captured making things nice and clear on what’s going to be snapped, ready for annotating.. Simple but none the less effective. With the mantra of keeping things quick and easy there’s 3 optins available. Rectangle, Arrow and Text is pretty much all the tools you want if you’re sharing in a hurry. Version 1.1 which was released right at the time we were going to post the review came along adding some features we would of liked and then were released. That’s the power of positive feedback. Now you can draw with Pen tool, Undo / Redo Annotations implementation and you can run Glui in the menu bar, dock or both. There’s 2 options for sharing or saving. Down on the bottom right there’s a save to option so you can keep that capture locally. Next to that is where the online sharing magic happens. 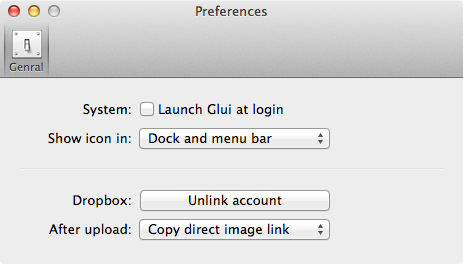 Within preferences you can choose between Glui copying the direct image link to the clipboard or a sharing link instead. Capturing retina images could end up with some rather large file sizes and thankfully Glui takes care of that, scaling down images suitable for non retina based macs. The only missing feature here is not to copy a link to the clipboard at all just in case. If you’re switching between apps and you hoard with your clipboard it could mean loosing something but I suppose if your in the swing of capturing and sharing you’ll be unlikely to loose anything. One more small gripe is the lack of a copy function to copy into another app if needed. If working with document it could get tiresome to have to insert via file instead of a copy and paste. Having gone an number of features updates Glui – Sebastian Razola has now hit version 1.3.6. Things like pixelation of certain areas of a screen grab, improved uploading to drop box along with a number of bug and performance fixes. Previous Previous post: Review : Jaybird Freedom – The Best Wireless Bluetooth Headphones For iPhone?